The above info came from Natalie Choo, and was edited by yours truly (contact me). The image came from over-blog.com. Saiunkoku Monogatari is about Shi Ryuuki and Kou Shuurei. 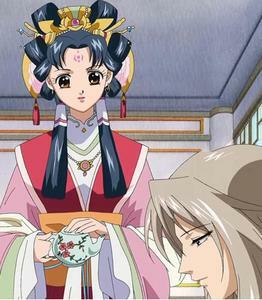 Shuurei was selected to be the temporary empress of the emperor Ryuuki. Ryuuki acts like a dumb emperor for him to find an empress, until Shuurei comes and teaches Ryuuki everything she knows about leading a country. Then came the episode where she found out that Ryuuki was only playing dumb with her. If I'm not mistaken, it was when Shuurei is about to drink a glass of wine with poison in it. After discovering this, Shuurei decides to go back to her home, together with Seiran who is actually Ryuuki's brother. There is also a love triangle here, Ryuuki loves Shuurei and Shuurei loves Seiran. In the end, who will Shuurei actually choose? Ryuuki or Seiran? Just watch it. The above description came from Ivory Pineda, and was edited by yours truly (contact me). Saiunkoku Monogatari takes place in an empire called Saiunkoku, and is about Shuurei Kou, a young girl who is from one of the two most powerful clans in Saiunkoku. She becomes the consort of Saiunkoku's emperor in order to help her family. The anime follows her adventures at the palace and around the province and how she changes and makes effects on people's lives. The above description came from Natalie Choo, and was edited by yours truly (contact me).